One important functions of the grinding fluid is to remove the heat generated at the many cutting edges of the the grinding surfaces and the grinding wheel. At the same time the fluid is to lubricate the grinding surface in order to reduce the wear of the grinding wheel. The grinding fluid also flushes away the grinding chips from the grinder. There are two major categories of water based grinding fluids; Mineral oil in water emulsion and semi/synthetic products in water coolants . Both of them are mixtures of lubricants; oil and synthetic lubricant. Normal dilution rate is between 1 - 5 %. Oil in water emulsion is milky white due to the oil droplets reflecting the light, and the synthetic is transparent since the lubricant is desolved in water. Generally both types of fluids do satisfy their expected function. However some users prefer synthetic fluid over oil in water emulsion due to it`s transparency, tramp oil rejection and quick sedimentation of grinding chips in spite of the disadvantages like fungus infections, week corrosion protection, stickiness when dry on the surfaces, soap formation at presence of desolved heavy metal or salts and also the higher price of the products. Grinding fluids include besides water and lubricants, bactericides to depress the growth of fungus and bacteria, and corrosion inhibitor. A contaminated fluid less duable against attack from microbes and also clogg the coolant passage between the cutting edges of the grinding wheel. The consequences will be the "burn marks" on the ground surfaces and gleazing the grinding wheel. It is utmost important that grinding fluids are containing a low level of solid particles and tramp oil. Traditionally systems like; hydro cyclones, magnet filters, and most widely paper band filter have been used due to its better filtration quality. 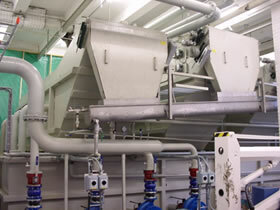 However, the paper filter system generates environmentally hazardous paper waste at expensive disposal costs. Vivex grinding fluid purification is a paper free filtration system that also has a built in evaporation cooling system that in some cases eliminate installation of external cooler. The contaminated fluid from the grinder is fed to the filter tank of DinoFilter with one or multi numbers of cylindrical filter drums with exchangeable permanent filter cloth of stainless steel mesh of arbitrary size on the cylinder mantle. The filtration in DinoFilter is carried out in an automatically operating self-cleaning drum filter with filter cloth on mantle surface of the drum. At the center of gable of the drum is connected to a pump that when be energized pumps filtrate out of the drum decompressing the drum simultaneously performs a "just in time filtration" of the contaminated fluid in the filter tank. During filtration a filter cake is created, and the flow rate of filtrate decreases. 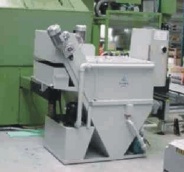 As the liquid level of the filter tank raises to a preset level or the depression of filter drum increases to a certain level, the filter drum will rotate against a stationary brush to sweep off the filter cake to the bottom of the filter tank. 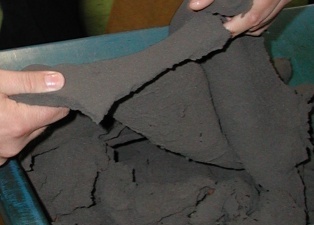 The bottom sludge in the tank will be removed by a scraper unit. All operations of the DinoFilter are automatic including the topping up of fresh coolant.